If you have a baby, one of the easiest ways to go green is to make your own baby food. You're torn. You're trying to declutter your home, but you don't know what to do with all those puzzles, toys, and games missing crucial pieces. You don't want to toss them in the trash to take up precious landfill space for the next few centuries, but who will want them? Remember those popsicle stick picture frames you used to make in Girl Scouts/Boy Scouts/elementary school? You glued four sticks together, taped a picture on the back, and proudly presented it to a parent or grandparent who smiled kindly and put it away with all the other "special crafts" so it wouldn't get damaged. You can take the same concept and make a frame with the kids that you'll actually want to display. I've made a few different versions of the popsicle stick frames with the kids I work with. In one, we've covered the sticks with puzzle pieces. I recommend doing two layers of puzzle pieces, just so there's more dimension to the frame. What happens when you've been asked to throw a baby shower but you don't want to contribute to all the waste associated with it? Streamers, paper plates, decorations that just wind up in the dumpster? 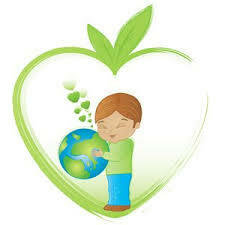 You're never too young to "go green!" Boston.com has a slideshow with pictures of the Earth Day festivities at the Boston Children's Museum. These pictures were too cute not to share, and it just goes to show you that you can teach kids to care about the environment at a very young age! Welcome to the inagural edition of the Keen for Green Quick Hits, a new regular feature providing links to articles across the internet. Read the articles below and comment. We would love to hear what you think. New biofuel rules expected to hamper fledgling green industry: By a 3-1 vote, the California State Water Resources Control Board said that gas stations, fleet yards and others who distribute the increasingly popular "green" fuel can only store biodiesel blends of up to 20 percent in underground tanks, even if the tanks are double-walled. This could limit the possible adoption of this new technology. Connecticut considers 'green cleaning' in schools: A coalition of health advocacy groups is asking lawmakers to join New York in requiring all public schools in the state to use environmentally friendly cleaning products. A bill awaiting action in the Connecticut House of Representatives would bar school districts from using products that contain various toxic substances. Youth Radio just produced a great segment concerning a group of young people's reactions to the Goldman Awards. All these young people were invited to the awards for their community activism.